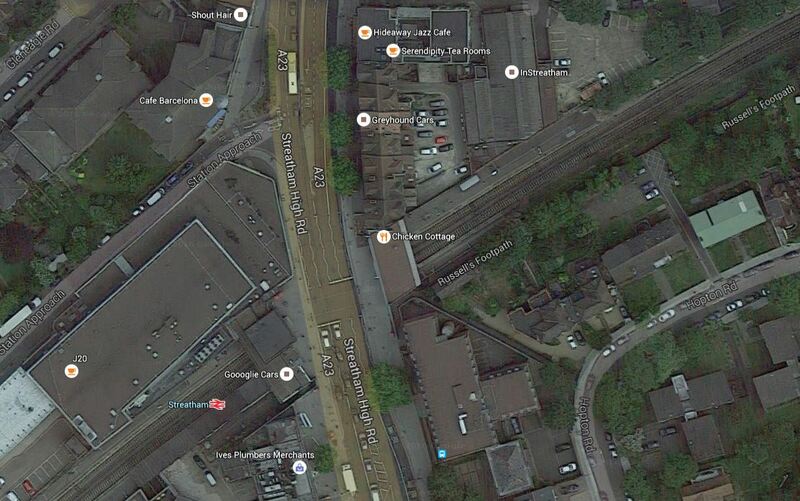 Would Third-Rail Tram-Trains Affect The Design Of The Proposed Streatham Interchange Station? Transport for London’s proposal for the Bakerloo Line Extension comes with a very nice map of the various projects that will be carried out to improve rail services in South London. It is all good stuff and most is easily explained. 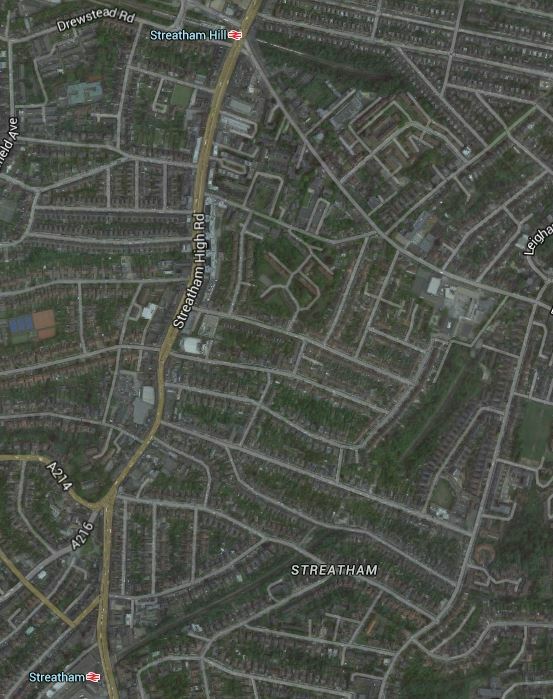 There is a little yellow box, which has a title of Streatham Common and contains the words. 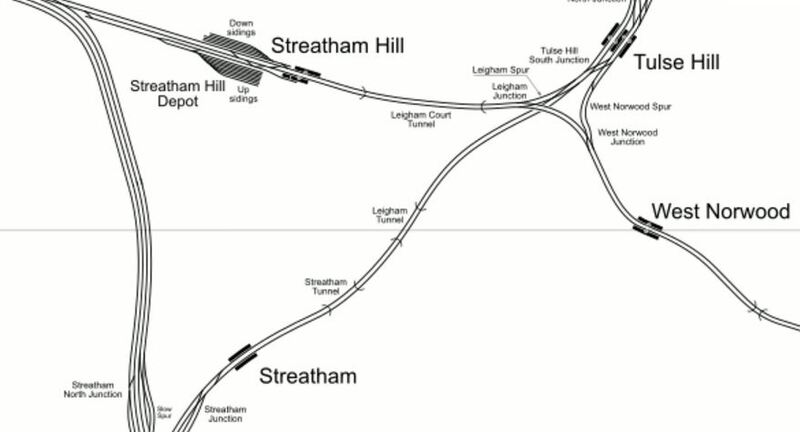 This map from carto.metro.free.fr shows the rail lines around Streatham and Streatham Common stations. 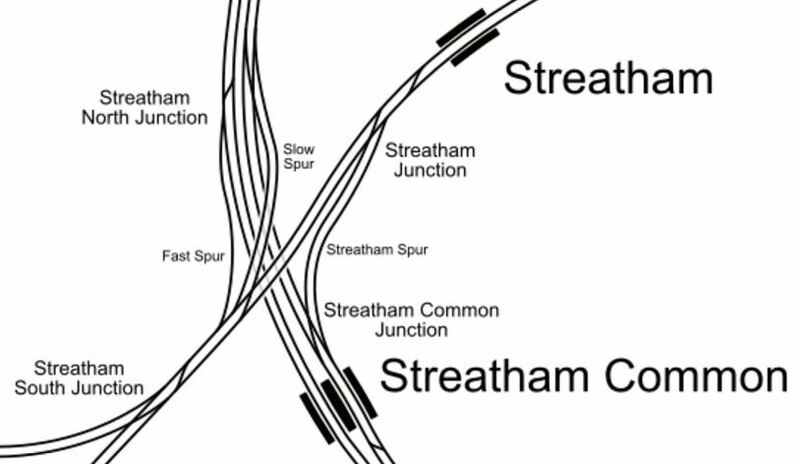 Streatham Interchange station has been proposed and could be at the major junction to the North of Streatham Common station. Trains on the following routes could call. Thameslink services on the Sutton Loop Line, through Wimbledon and Sutton. Various Southern services between London Bridge and Victoria in the North and Caterham, Croydon, Epsom and Sutton in the South. Fast services between Victoria and the Brighton Main Line pass through. I have also seen speculation on respected web sites, that the Overground will be extended to the new Streatham Common Interchange. I suspect Transport for London’s plans will improve the lot of many travellers. If Streatham Interchange is going to be an important hub, then surely, it should be served by the Tramlink. Third-Rail tram-trains would be able to run from any of these power sources. Third-rail electrification on rail tracks. Batteries on any tracks, including those without any electrification. Most power changeovers would take place at tram-stops or stations. Although, I suspect that changing bertween battery and third-rail power would be automatic. Third-rail tram-trains could run into Streatham Interchange on any standard third-rail track and could use any platform, be it a through platform or a bay one, that is used by standard trains. These are the two obvious routes. This map from carto.metro.free.fr shows the track layout at Mitcham Junction station and Tramlink between Mitcham and Beddington Lane tram stops. Note that the black tracks are the Sutton Loop Line with Mitcham Eastfields station to the North and Hackbridge station to the South. I think it would be possible, from what I have seen on other tram-train systems, to link the Sutton Loop Line to Tramlink, so that tram-trains could go between Bedddington Lane and a proposed Streatham Interchange. A tram-train going between Croydon and Streatham Interchange would do the following. Stop in Beddington Lane tram stop. Drop the pantograph and change to battery power. Proceed to Mitcham Junction station. Run as a train to Streatham Interchange. In the opposite direction, the sequence would be reversed. 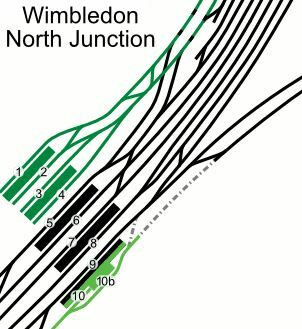 This map from carto.metro.free.fr shows the track layout at Wimbledon station. 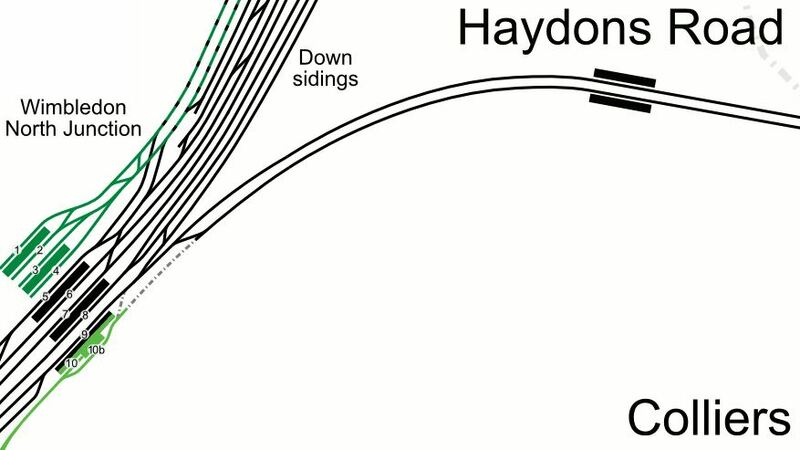 Haydons Road station is on the Sutton Loop Line going towards the proposed Streatham Interchange. This picture shows a Thameslink train in Platform 9 and a tram in Platform 10b at Wimbledon station. I think it could be possible to make Platform 10b into a bi-directional Tramlink platform to connect to Streatham Interchange. Currently, twelve trams per hour turn at Wimbledon and I suspect that this needs two terminating platforms. Connecting tram-trains at Wimbledon to the Sutton Loop Line may be tricky, but it should be easier at Mitcham Junction. However, so long as Streatham Interchange has enough capacity for Tramlink services, there shouldn’t be a problem. The Sutton Loop Line is a bit of a problem. It runs two trains per hour (tph) in both directions. It is not the most heavily-used of lines. It is deeply political and difficult to make any changes. Network Rail’s original plan is described under Political Developments in the Thameslink entry in Wikipedia. This is said. Network Rail had planned to terminate Sutton Loop Thameslink trains at Blackfriars station, rather than have them continue through central London as at present. This would increase the capacity of the central core as the Sutton Loop could only accommodate shorter trains. This upset many residents in South London and their local politicians, who saw it as a reduction in services rather than an improvement. In response to pressure, government has ordered Network Rail to reverse the decision. Was this design by those, who don’t understand the complexity of designing and running a train service? On the other hand, the line has some strengths. It is a double-track railway. It is fully-electrified using 750 VDC third-rail. There seems to be quite a bit of housing and other development. But in some ways, the line’s biggest strength, is the wide margins at both sides of the tracks. 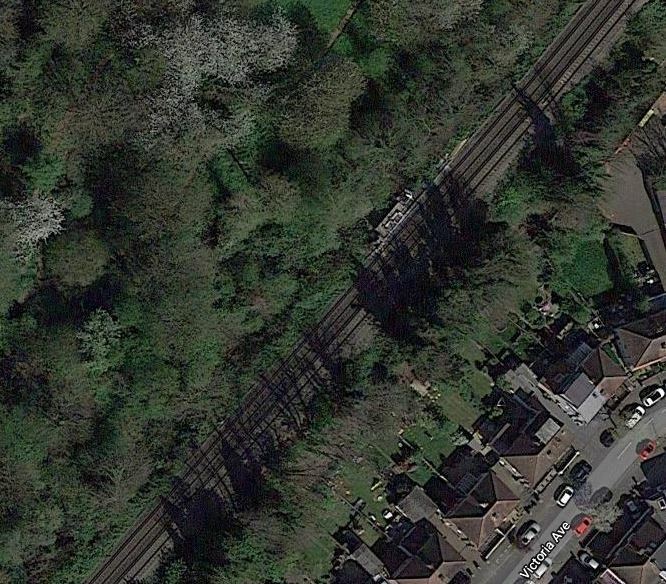 This section between Hackbridge and Carshalton stations is not untypical. Adding extra platforms or complete stations would not be difficult. What solutions are available to improve train services on the Sutton Loop Line, for both passengers and train operators? In Has Thameslink Got The Wrong Length Of Train?, I proposed the following. Using twelve- and six-car trains on Thameslink. Allowing two six-car trains to work as a twelve-car unit. Trains would be able to join and split automatically, as Hitachi’s Class 395 trains are able to do. I also proposed the following method of operation for the Sutton Loop Line. 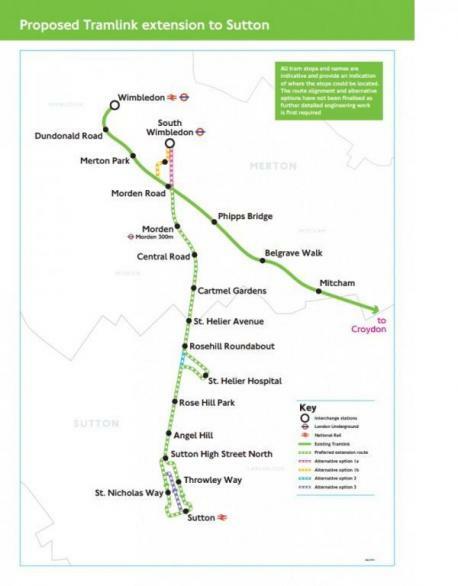 The Sutton Loop Line could be run by using six-car trains that split and join in the area of Streatham station. This map from carto.metro.free.fr shows the track layout at Streatham, at the start of the loop. Streatham South Junction is the gateway to the Sutton Loop, with the tracks to the West going via Tooting station and those to the South via Mitcham Eastfields station. There is a lot of spare land in this area. Transport for London keep talking about creating an interchange at this point. 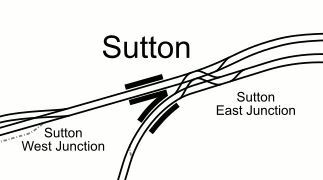 I think, if and when the interchange is built, it could be designed, so that it increased traffic around the Sutton Loop Line. Two six-car trains running as a twelve-car could split at the interchange. One train would go round the loop clockwise and the other anti-clockwise. The trains would rejoin together at the interchange. The same procedure could be done at Streatham, without creating the interchange, but it would block the station, if trains got delayed on the loop. Currently, two trains per hour (tph) are proposed to run in both directions on the Sutton Loop Line. This requires four eight-car trains and four paths through the central core. If four six-car trains were to be used, running in pairs splitting at Streatham station or a new Streatham Common interchange, there would still be two tph in both directions round the Sutton Loop, but only two paths would be needed in the central core. Travellers to and from stations on the loop would see six-car, rather than the current eight-car. If the number of six-car trains were to be doubled and four paths used in the central core, the Sutton Loop Line would see four tph in both directions. It sounds complicated but it would work and it has the following advantages. Train frequency could be increased as required. Paths are released in the central core. Twelve-car trains would go through the central core, where the capacity is needed. The service would need a few more drivers and other staff. 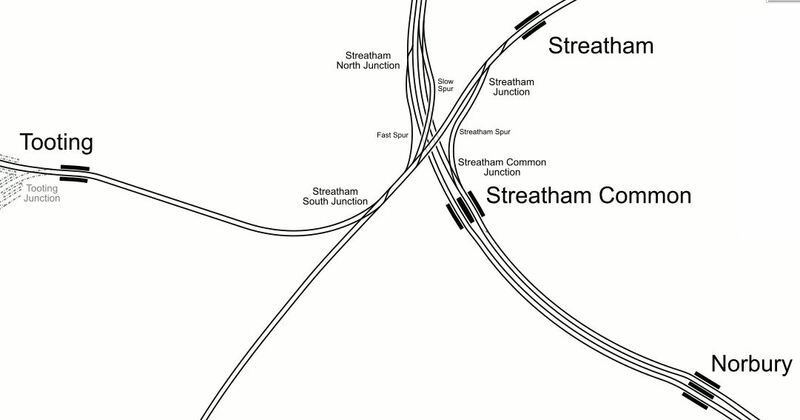 If a new interchange station is built at Streatham Common, then extra services could easily be run round the loop. Thameslink services could be reduced to perhaps one tph in each direction. These would be augmented by perhaps a four tph shuttle around the loop starting and finishing at Streatham Common. The shuttle trains could be any suitable unit, but surely a four-car would suffice. I suspect that this wouldn’t work, as it would upset the natives. I can’t help feeling that the Germans and especially those in Karlsruhe would look at the Sutton Loop Line and because there are both trams and trains, in the area, they would come up with a solution based on trains and tram-trains. As fsr as I know, no-one has ever built a third-rail-powered tram-train! But I don’t think that a tram-train powered by third-rail electrification, when running as a train is an impossibility. I lay out my ideas in The Third-Rail Tram-Train. As to safety, look at this picture taken at Mitcham Junction station. Note how the third electrified rails are in the middle away from the platforms. This is standard practice with this form of electrification. So if it is deemed to be safe for trains now, it will surely be safe for third-rail train-trams. When running as trams, the tram-trains will use 750 VDC overhead electrification. Tram-trains will need to change between the tram and rail networks. This map from carto.metro.free.fr shows the track layout at Mitcham Junction station. Wimbledon is to the West and Croydon is to the East. With the addition of some extra tracks, it should be possible for tram-trains to pass between the networks. As trams can take tight curves, a chord could allow Westbound tram-trains from Croydon to turn South to Sutton. Tram-trains will probably change networks using a couple of ininutes of battery power. I doubt any of the engineering will be too difficult. Tram-trains would take the following route. Arrive from Croydon at Mitcham Junction, where they would turn South onto the Sutton Loop Line. Pass through Hackbridge and Carshalton stations. Call in Sutton station for interchange with trams and National Rail. Continue to Wimbledon station calling in Platform 9 for interchange with trams in Platform 10 and 10b and National Rail. Pass through Hatdons Road and Tooting. Take new chord to cross to the other leg of the Sutton Loop Line. Pass through Itcham Eastfields station. Rejoin the tram route at Micham Junction station. Tram-trains could also travel in the reverse direction. This map from carto.metro.free.fr shows the track and platform layout at Wimbledon station. Currently, Thameslink services on the Sutton Loop Line use Platform 9 in both directions. Hayons Road station is to the North-East and |Wimbledon Chase station is to the South. Tram-trains on the Sutton Loop Line would do the same. Platform 9 probably defines the capacity of the Sutton Loop Line. Access to the trams in Platforms 10 and 10b, is just a walk across the platform. The picture was taken from a Thameslink train. There might even be space for another tram platform, that can be accessed from the Haydons Road direction. This map from carto.metro.free.fr shows the track and platform layout at Sutton station. The Sutton Loop Line is the Northernmost pair of tracks. Carshalton station is to the East and West Sutton station is to the West. It could be possible for tram-trains to by-pass Sutton station and run on the streets of Sutton. 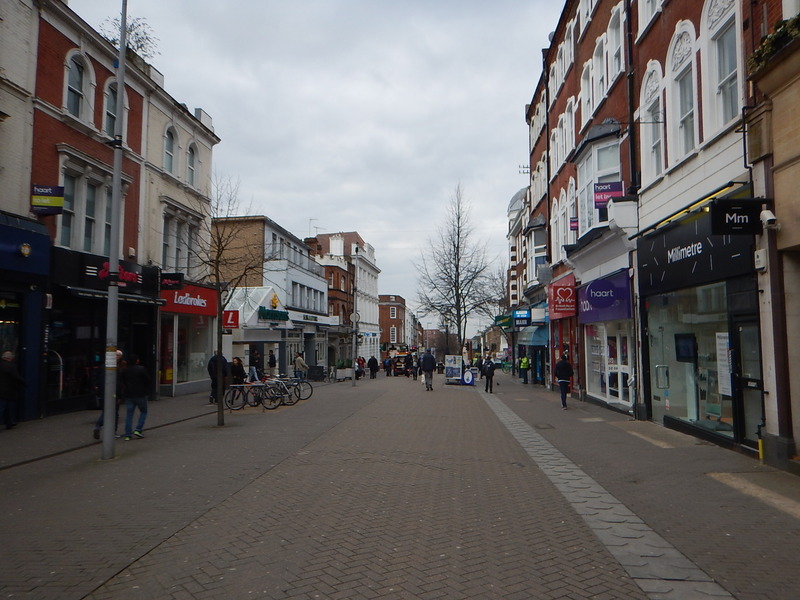 This picture shows Sutton High Street. Is it going to be easy to bring the planned tram extension from Wimbledon to Sutton? Platforms at the stations on the Sutton Loop Line are long and are certainly capable of taking eight-car trains. But are they long enough to have a lower section of platform, so that tram-trains can have step-free access? This is one of the problems, that should be solved in the tram-train trial in Sheffield. 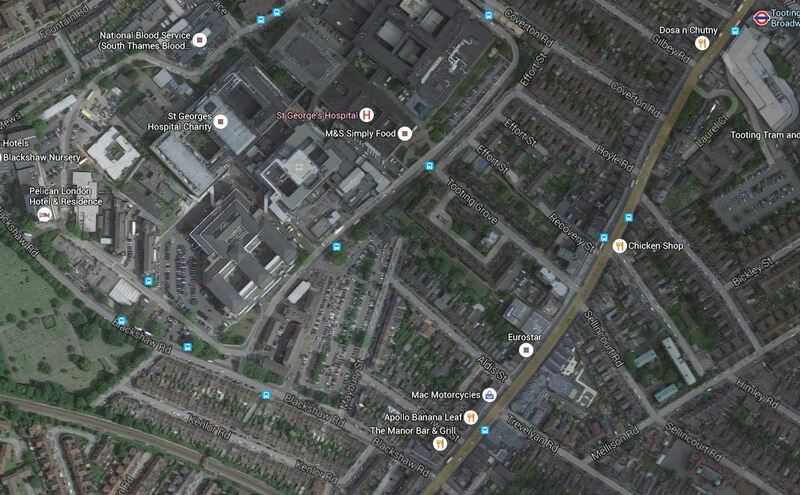 This Google Map shows, where the two routes of the Sutton Loop Line meet near Streatham Common station. 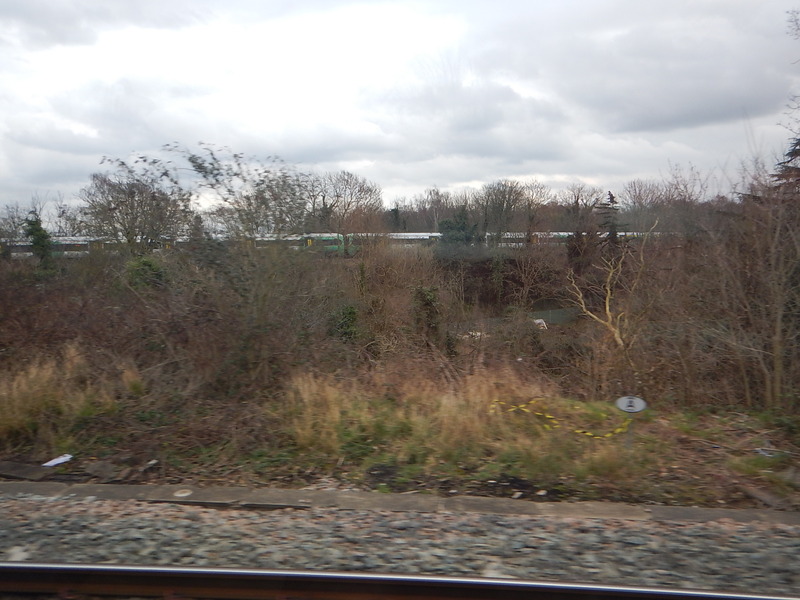 This picture shows a train going towards Mitcham, from one having passed through Tooting station. I don’t think it would be the most difficult engineering project to create a chord, that would allow tram-trains to go directly between Tooting and Mitcham Eastfields stations. As I said earlier, Platform 9 at Wimbledon station. is probably the limiting factor on services round the Sutton Loop Line. Thameslink is planning two tph in both directions. I suspect that this could be supplemented by two tph services run by tram-trains, if a signalling solution can be implemented to allow four tph in each direction, through the platform. There are several ways to improve the Sutton Loop Line. The Sutton Loop Line is not well known in North London, except as a routing shown on Thameslink train information displays. This morning, I took the line from Tooting station and after a short stop at Sutton station, I continued on my way back into Central London. These are some of the pictures that I took. I think the trip did give me a better understanding of this line in South London. Very few of the stations I passed through had any form of step-free access. Some were island platforms, which have their advantages, but access up and down a single wide staircase to a road overbridge is so nineteenth century. Some stations have had a refurbishment and others haven’t! The curious timings on the loop, actually mean that from Streatham station northwards or southwards, the trains have an interval of very close to fifteen minutes. So it would be prudent to check, that you’re always taking the best way to get to your destination station! These points are specific to stations of sections of the line. According to this article in he Local Guardian entitled St George’s Hospital Trust announces support for Tooting Broadway in Crossrail 2 plans, the hospital trust is not happy. It would be ridiculous to spend the best part of an extra billion pounds on Crossrail 2 to put the line through Tooting Broadway station, rather than Balham station, when that money could probably be spent on a mixture of patient care , better bus links, and a lift or two at the Underground station. The latter will happen anyway, whether Crossrail 2 is built or not! Could there be a better solution for step-free transport access to St. George’s Hospital? Look at this Google Map of the hospital in relation to Tooting Broadway station and the Sutton Loop Line to the west of Tooting station. Tooting Broadway station is at the top right of the map and the Sutton Loop Line runs across the South West corner of the map. If a new station were to be built on that line, with full step-free access, it would be closer to the Hospital, than any station on Tooting Broadway. It would also be close to some of the bus stops that serve the hospital. 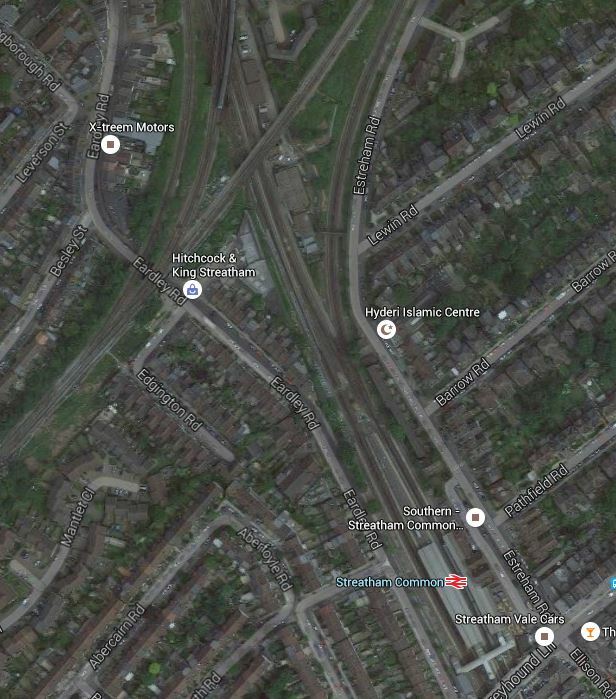 This Google Map shows Haydons Road station and the site of AFC Wimbledon‘s new home at Wimbledon Stadium. 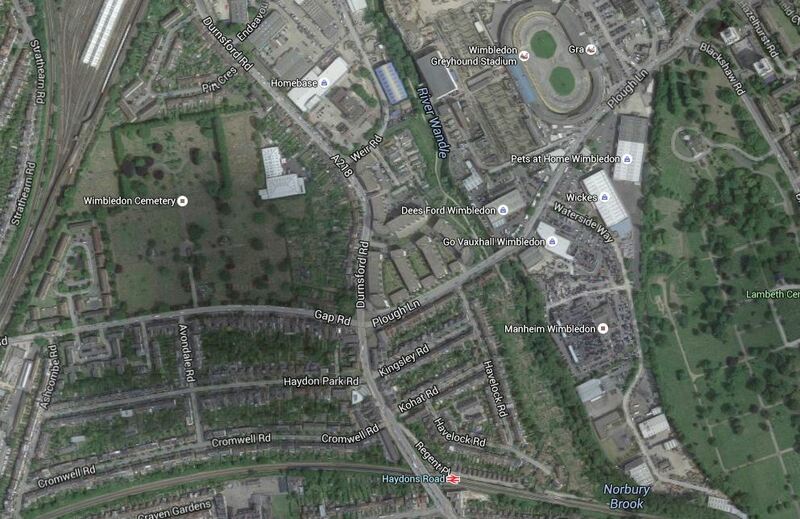 The stadium will be at the old greyhound stadium, which is the two green circles at the top. The green scar from the stadium site to the east of the station, is the course of the River Wandle. Surely, a riverside walk should be created for supporters walking between the stadium and station. The map also shows the amount of land wasted in the area by unnecessary cemeteries. How many houses could be built on the land they occupy? 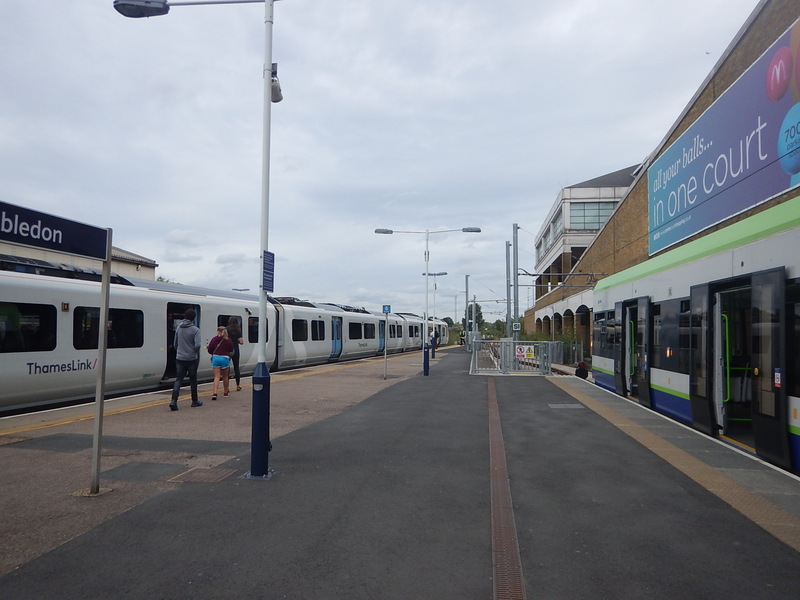 Trains on the Sutton Loop Line always use Platform 9 at Wimbledon station, which gives cross-platform access to Tramlink on Platform 10. So one train might be going to Sutton and the next to Central London and beyond. These two stations are shown on this Google Map. 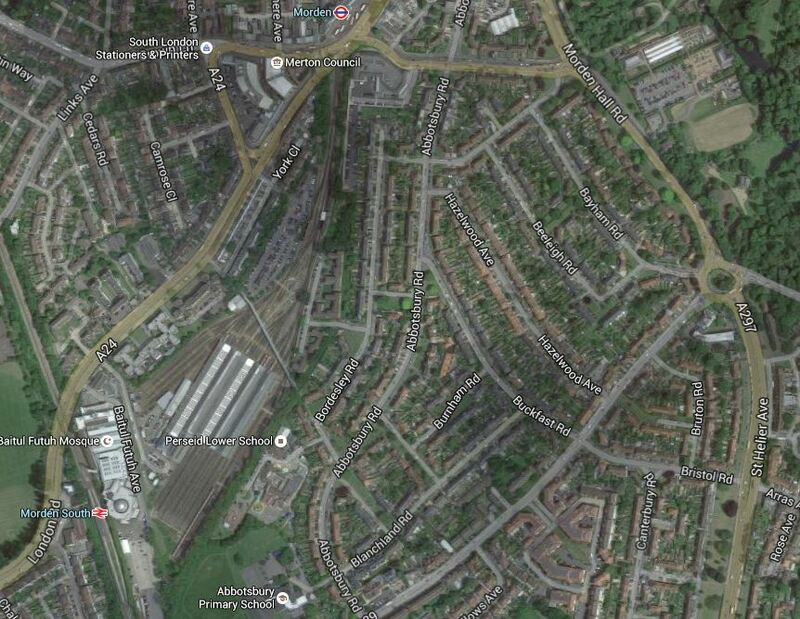 Wimbledon Chase station is at the top left and South Merton station is at the bottom, just tom the left of the middle. You will notice, I’ve included the main A24 road on the map. This is because that road could be used for an extension of Tramlink from South Wimbledon to Sutton via St. Helier Hospita;. This map shows that extension. Transport for London and the London Borough of Merton are opening up a lot of possibilities here and I hope that a world-class solution emerges, to link the whole corridor together. Their close location and the depot in betwen, has always puzzled me. It is explained in the History section for the Wikipedia entry for Morden station. It was all down to railway politics, between Southern Railway and the Underground companies. You just wonder though, if they were sorting out the lines around Wimbledon, that something could be done to make it easy to connect between the two stations. I hadn’t heard about Hackbridge, which is a suburb in the London Borough of Sutton. 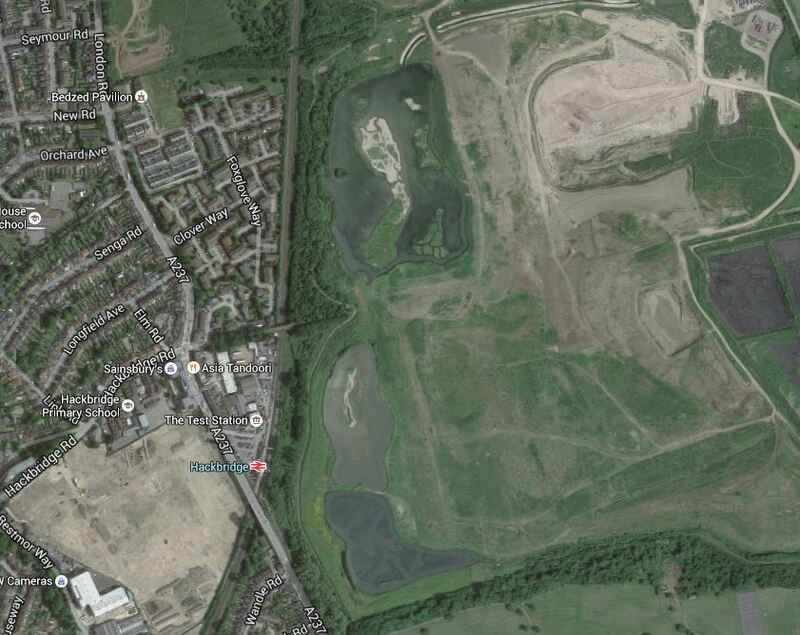 But there is a Hackbridge Masterplan on Wikipedia. This is the first paragraph. The London Borough of Sutton is working to make Hackbridge the ‘UK’s first truly sustainable suburb’. There has been a regeneration scheme in Hackbridge which has a number of developments on many sites. These are mentioned as part of the Hackbridge Regeneration. Detailed plans include proposals for new eco-friendly homes, more shops, leisure and community facilities, jobs, sustainable transport and pedestrian/ cycle initiatives, improved networks and open spaces. It all sounds good to me. This is a Google Map of the area. Note the rail line going up the map with Hackbridge station about a quarter of the way up.At the top of the map, is an icon indicating the BedZed Pavilion. If they are truly into green transport, it strikes me, that there needs to be another station between Hackbridge and Mitcham Junction, which is the next one to the North. As the Tramlink through Mitcham Junction runs down the eastern side of the site and has a stop at Beddington Lane on the north east corner, I would also feel that there scope for extensions to the through Hackbridge. With all the investment in Thameslink, there is no doubt that the future of the Sutton Loop is secure, but what will it look like in ten or twenty years? I think it seems to have suffered a lack of imaginative thinking in the past few years, but with Transport for London thinking hard about a new interchange hub at Streatham Common station, that I wrote about in Puzzled Over Streatham Common Station, I think we’ll see some more improvements. A lot of the stations need to have a refurbishment and proper step-free access. If this follows the pattern of previous lines in London and elsewhere, I think that after station improvement, this line will need additional services. As it won’t be possible to get more trains through the core, then this could need for some form of local train or tram-train on the loop. Perhaps these would terminate at perhaps Streatham Common station, which I wrote about in Puzzled Over Streatham Common Station. If two extra trains each way round the Sutton Loop were to be added, they could be timed to run every fifteen minutes between the existing services. So each station on the loop would get a four trains per hour service both ways. One possibility would be to do the extra services with tram-trains, which after Streatham Common, went on to Croydon to connect up with the existing Tramlink routes. As I said earlier trains go through Streatham to and from the loop every fifteen minutes, which would be every 7-8 minutes with the extra trains. So if say you wanted to go to Central London, if you caught an intermediate train on the loop, you might have to wait 7-8 minutes for a Central London train. Obviously, traffic patterns will determine how the line develops, but I predict that there will be a big future for the Sutton Loop. The black boxes are about more general and larger projects, whereas the yellow boxes are comments about specific stations. The projects; large and small, fit together like a jigsaw. And not a particularly difficult one to understand! Of the larger projects, the simple extension of the Bakerloo Line to Lewisham station via two new stations and New Cross Gate station is a masterstroke. It provides a thirty trains per hour rail link through the Old Kent Road Opportunity Area. It gives all those living on the East London Line, as I do, a much needed connection to the Bakerloo Line. Coupled with an upgraded Lewisham station, it gives South East London access to the Underground. The project can be opened without an expensive set of new trains. New Cross Gate and Lewisham stations have space for construction. The extension can be built with minimal closure of the Bakerloo Line. The project is almost a repeat of the Northern Line Extension. No-one’s current train service will be discontinued. There is no replacing heavy rail with smaller Underground trains. If in the future, the line needs to be extended, this will be no problem, if Lewisham station is designed correctely. The only negative, is that the plan doesn’t provide a much-needed rail link in Camberwell. But Transport for London have done there research and have concluded that reopening the disused Camberwell station on Thameslink could be a worthwhile alternative. The TfL report gives this concise summary. A new station at Camberwell would be a significantly lower cost option to a Tube extension, whilst serving the same catchment area. Investigations show significant journey time improvements could accrue to Camberwell passengers and that operationally there may be scope to integrate re-opening of the station into the launch of the completed Thameslink programme. We will therefore undertake further planning work with Network Rail and the London Borough of Southwark to assess the proposal. It is a second masterstroke. Camberwell station will probably get a similar service to Loughborough Junction station. I’m not sure what it will be, but something like four eight-car trains an hour both ways. In around fifteen minutes, passengers could be at. Farringdon for Crossrail and the Metropolitan Line. Kings Cross St Pancras for main line services and the Victoria Line. Camberwell station could easily be double-ended, with entrances on both sides of Camberwell New Road. Camberwell would get at least a high-capacity four trains per hour service to virtually everywhere, with just a single change. And this could be delivered by 2020, if they get the turbo-charged engineering skates out. On the South London map, there are some other stations mentioned. All of these station upgrades are understandable, with the exception of Streatham Common station. I can only believe that Transport for London have a cunning plan for this station and the tangle of lines to its North. So what would an interchange hub be like? In the simplest design, two platforms would be built across the lines through Streatham Common station alongside the Sutton Loop Line. They would be connected to extended platforms from the existing station, by stairs and lifts. I think there would be space to build some bay platforms into the station, so that Streatham Common station could be used as a terminus. 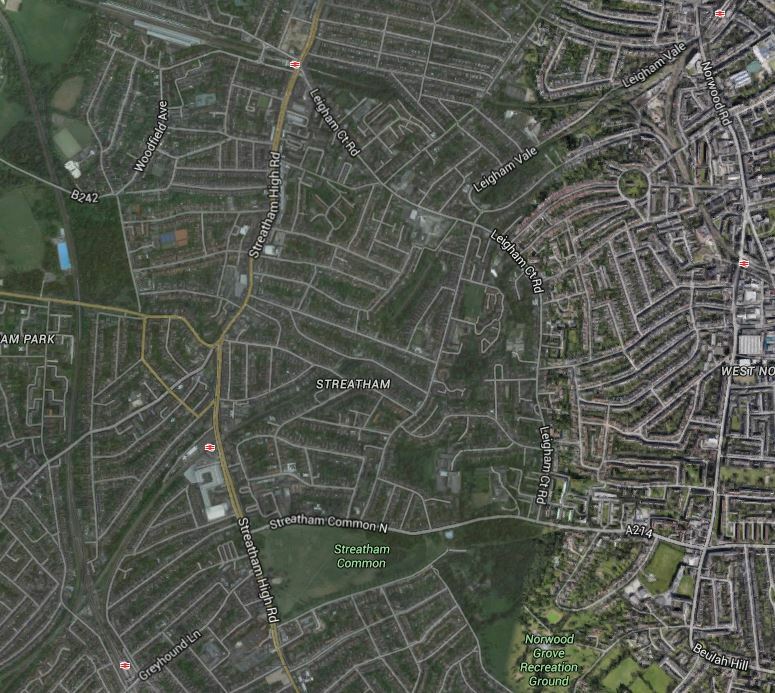 Note how there are very few rail lines, south of Streatham towards Mitcham Eastfields station. Wikpedia says this about the station. The station is located at Eastfields Road level crossing, in an area previously poorly served by public transport. 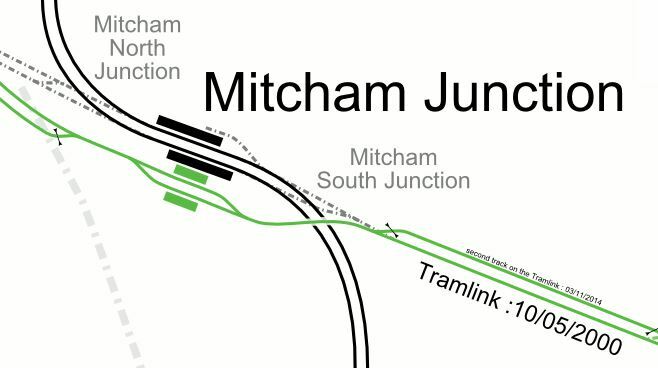 The nearest station was Mitcham Junction, which along with Mitcham tram stop, was over 1 mile (1.6 km) from the district. I wrote about the station in Mitcham Eastfields Station. The lines that currently go or could go through the Dtreatham stations are set out in the following sections. Streatham station is the last station on Thameslink before the Sutton Loop starts and finishes. Stations on the Sutton Loop include. The fourteen stations have the following service. Currently, there are two trains per hour in each direction on the loop. 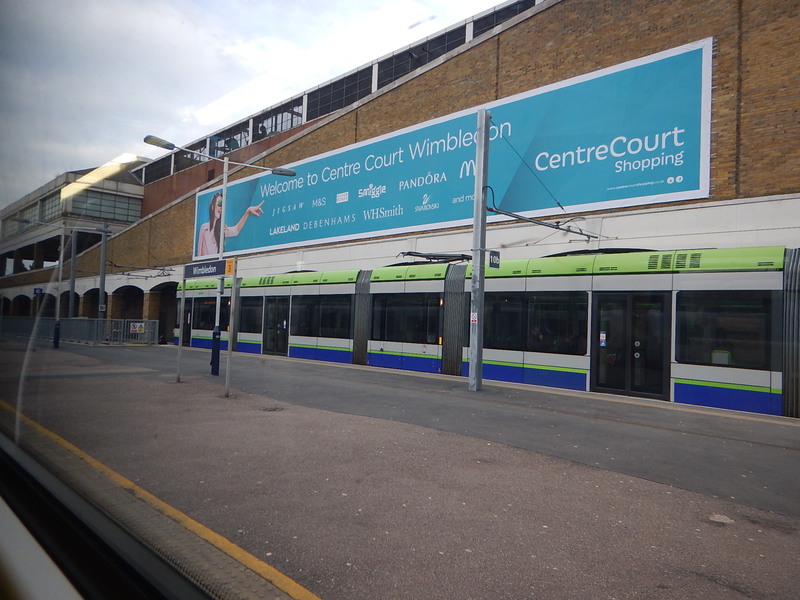 Only Mitchan Junction and Wimbledon have connecions to Tramlink. I think Streatham to Streatham takes about forty-five minutes of travelling time. These trains eventually terminate and come back at St. Albans or Luton in the Peak. When the ongoing Thameslink Programme is finished, there will be two eight-car Class 700 trains in each direction every hour. When the Thameslink Programme was planned, Network Rail intended to terminate these services at Blackfriars. Residents and their politicians objected! Wikipedia says this. Network Rail had planned to terminate Sutton Loop Thameslink trains at Blackfriars station, rather than have them continue through central London as at present. This upset many residents in South London and their local politicians, who saw it as a reduction in services rather than an improvement. In response to pressure, government has ordered Network Rail to reverse the decision. I think this illustrates a certain sensitivity about train services in the area. Do they think that other places like Balham, Croydon and Wimbledon, get all the goodies? So we have four trains an hour through the core section of Thameslink going on the Sutton Loop. Although, this shouldn’t affect the services on the loop, could this cause problems for passengers on the trains through Wimbledon and Sutton, as long-distance trains are being used for short local journeys. For example, you might have mothers with buggies taking babies and children to nurseries and schools, mixed up with commuters, who want to go north of the Thames. A simple solution would be to have more trains going round the loop, so that instead of just two trains per hour each way, there were perhaps four or even more. But where would they come from? They could come a long way from somewhere like Orpington or Cannon Street, which would mean finding paths all over South East London and perhaps beyond. Or perhaps they could just do the loop and start and finish at either Streatham or an expanded Streatham Common. As Streatham is just a two platform station, with little space to expand, a bay platform in Streatham Common might be one solution. 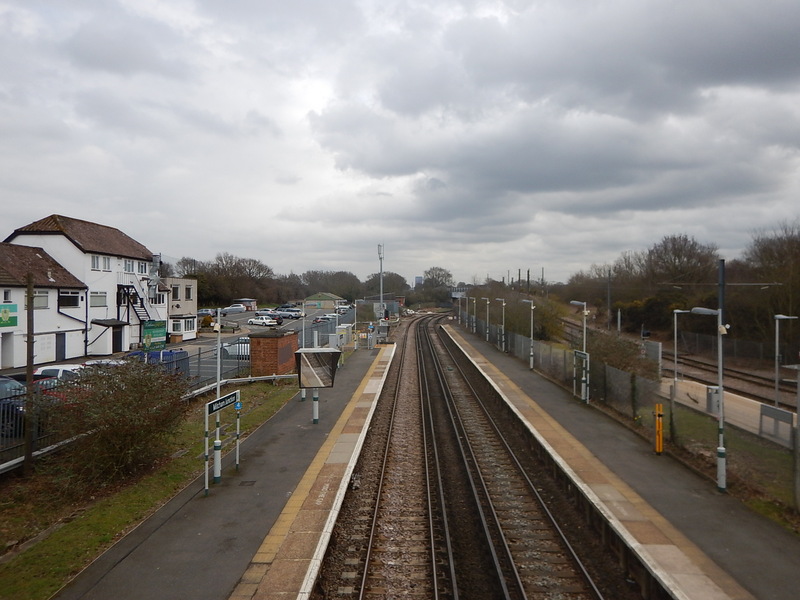 Possible Reason for an expanded Streatham Common station – The station could be the terminus of a two train per hour local service around the Sutton Loop. The Brighton Main Line goes from Victoria to East Croydon with fast trains generally only stopping at Clapham Junction station en route. However services pass through several important stations like Balham and Streatham Common without stopping. Could there be advantages in stopping some of these services at an upgraded Streatham Common? I don’t know under normal circumstances, but there may be good operational reasons for services to be able to call at Streatham Common station. Possible Reason for an expanded Streatham Common station – The station could be a valuable interchange between Brighton Main Line and other services. Although Tramlink doesn’t go anywhere near Streatham at present, it does have a main route, south of the area. There is also a distinct lack of rail services in the area between Streatham and Mitcham, which led to the building of Micham Eastfields station. In Wikipedia, it says that extensions to the Tramlink have been proposed North and South of Croydon. This is said about North of Croydon. Possible Reason for an expanded Streatham Common station – The station could be a destination for Tramlink. In areas of Germany, where there are both trains and trams, the Germans are getting very enthusiastic about tram-trains which can run on both networks. 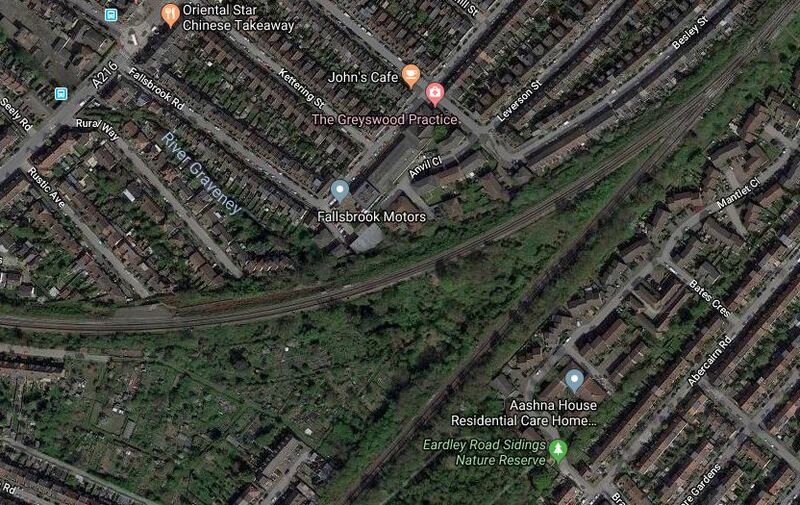 If tram-trains, were to be used on a possible Tramlink Extension to Streatham, they could join the railway at a convenient station, like Norbury or Streatham Common and become trains to go round the Sutton Loop. 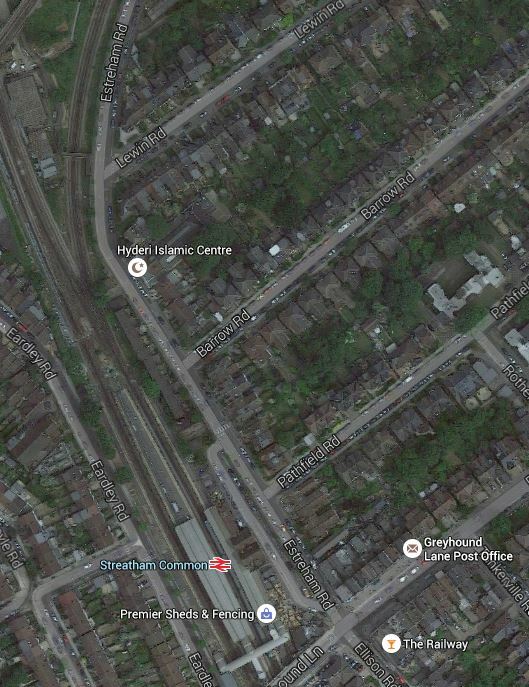 Possible Reason for an expanded Streatham Common station – Tram-trains on Tramlink. I use the East London Line a lot and it has the problem of success. Trains have grown from three to five cars and some recent trips from Denmark Hill to Dalston Junction have shown, that at times standing is common. Increased frequencies in 2018/2019, will ease the problems, but would another terminus in South London be a good idea for the East London Line? The capacity of the core section of the East London Line is twenty-four trains per hour, so even from 2018/2019, there are four more paths available. So could we see some services going to Streatham Common station perhaps via Peckham Rye, Tulse Hill and Streatham? A factor that might apply here, is can Platform 1 at Clapham Junction cope with enough trains from Dalston Junction? Possible Reason for an expanded Streatham Common station – A terminus for a branch of the East London Line. Southern’s hourly service between South Croydon and Milton Keynes calls at Streatham Common station. London Overground has a service of around four trains per hour on the West London Line between Clapham Junction and Willesden Junction, which Southern’s service augments for part of the route. But there are problems with the West London Line. There are some extended service intervals at times. The Southern service doesn’t call at Willesden Junction. West London Line services call at different platforms at Clapham Junction. Unlike the East London Line, the West London Line is not a turn-up-and-go service. So could there be advantages to use Streatham Common station, as a southern terminus for services through the West London Line? Possible Reason for an expanded Streatham Common station – A terminus for the West London Line. When HS2 opens in 2026, getting to Euston station will not be easy, as it is unlikely that Crossrail 2 will have been started, let alone up and running. Passengers will need to get to a Northern or Victoria Line station and have a deep and possibly tedious journey across Central London. Thameslink will be of use to some, but there will be a walk or a short-but-difficult tube journey between St. Pancras and Euston. But HS2 will stop at Old Oak Common station on the North London Line. 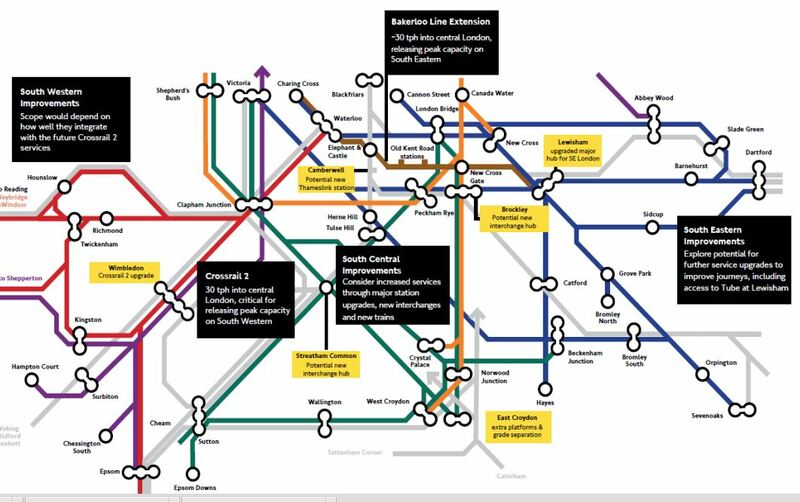 If the West London and East London Lines were to be extended to Streatham Common station, either could be a good alternative route to HS2 and the West Coast Main Line. I estimate that Streatham Common to Old Oak Common will take thirty three minutes, compared to Morden to Euston on the Northern Line, which can take forty-one minutes. Crossrail 2 is not planned to call at Streatham Common station, although it might go underneath in its route from Balham to Wimbledon. Even so, I suspect that an expanded Streatham Common station will be to the advantage of Crossrail 2. As I said earlier the station can help improve services on the Sutton Loop, which would have effects. Bring more passengers to Wimbledon for Crossrail 2. If extra stations were added to the Sutton Loop, these could help solve the Tooting Broadway/Balham wars. Could a new station be built at St. George’s Hospital, between Tooting and Haydons Road stations? But the biggest benefit would be that Streatham Common station, would be an alternative hub, for those wanting to avoid Wimbledon during the building of Crossrail 2. When East Croydon station is being extended or the grade separation at Windmill Bridge Junction is being built, surely a well-connected interchange at Streatham Common, could be an asset towards helping to maintain a service. Even under normal circumstances with a decent tram and train connection to Croydon, Streatham Common station may take the pressure off public transport in Croydon. Build a Streatham Common interchange hub! It is just a pity that Crossrail 2 can’t have a station at Streatham Common. 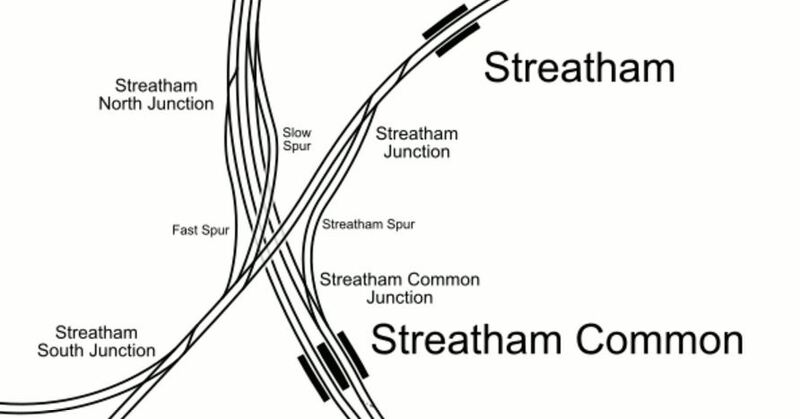 Is the Streatham Common interchange hub, a third masterstroke?